In last week’s entry I described the forthcoming British referendum on continued membership of the EU as a bit surreal. After the event things have not become less surreal, and there’s little prospect they will do so in the near future. The traditional media as well as the more informal Internet-born media is awash with the aftermath. I have neither the knowledge and fighting spirit to want to take it up myself. Nor do I have the distance and emotional detachment to turn away and spend time with something completely different. The Telegraph was, like most of the British print media, a supporter of the Leave side. This map underlines the strength of the vote for Leave. It shows the final result in the 12 regions of the UK (and in Gibraltar). Also notice that, though Scotland is a large area for Remain, nine of the 10 areas of England and Wales are solid for Leave. The only exception is little London down in the south east corner. 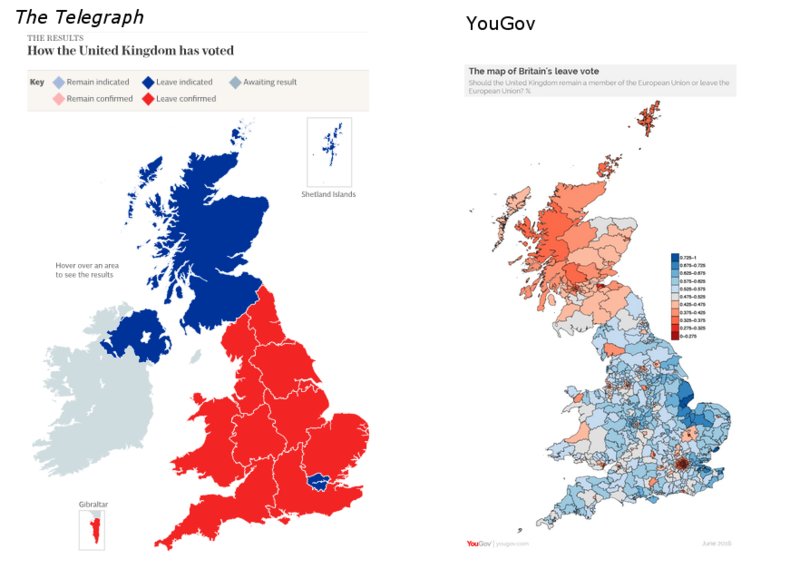 The Guardian’s cartographers chose to distort the geographic representation of the UK. They did this to better represents the population of each of the 382 voting districts. 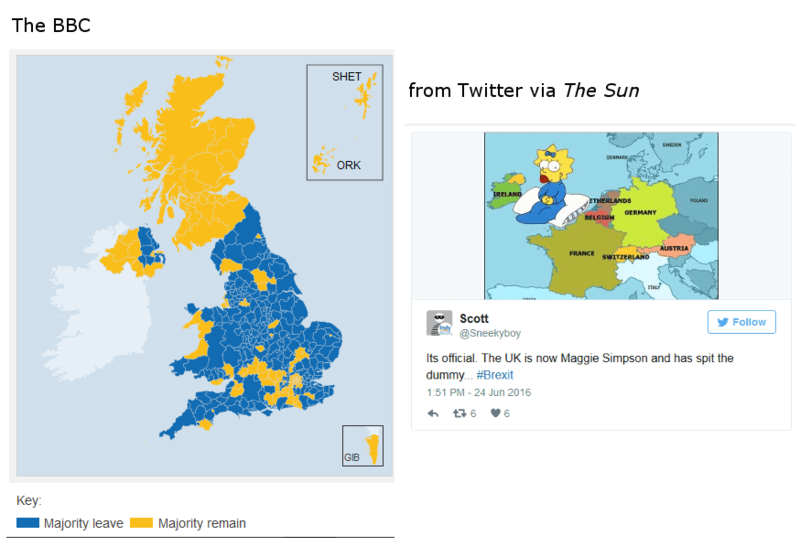 You can easily identify the map as the UK, but compare it with the other more conventional referendum maps above. You’ll see at once how the weight of the population of Britain in London and the South East makes a huge difference. Especially compared with The Telegraph’s map, the phenomenal Remain vote in London is seen in its true proportions. Though also the swelling population of Leavers in the Midlands. I originally published this article on the separate Stops and Stories website. Transferred here with a little polishing for SEO and a new featured image 3 July 2017.